Wanted: Development 2.0 to catch up with web 2.0! Did anybody hear of the senior UN official who finally started blogging? He wrote perceptively and expressively – with some help from his speech writers – but a vital element was missing in his blog: no one could comment on his posts as he completely disabled that function. Then there is the Red Cross chief who started her own Facebook account but remained completely ‘friendless’ for months – because she didn’t accept anyone seeking to join her social networking effort! These are just two among many examples I have come across in recent months. They are all symptoms of a major challenge that development and humanitarian communities are grappling with: how to engage the latest wave of Information and Communication Technologies, or ICTs. 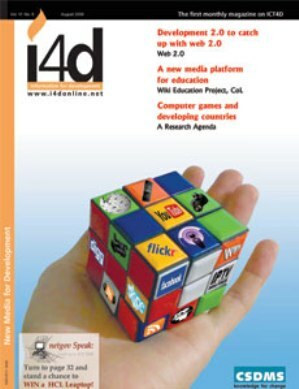 With these words, I open my latest essay, titled “Wanted: Development 2.0 to catch up with web 2.0” in the August 2008 issue of i4d magazine, published from New Delhi, India. My thrust is something regular readers of this blog would be familiar with. In fact, in this essay I consolidate and expand on ideas that were initially discussed in various blog posts over the past many months. The new wave of Internet, collectively known as Web 2.0, opens up new opportunities for us in the development and humanitarian communities to reach out and engage millions of people – especially the youth who make up the majority in most developing countries of Asia. But it also challenges us as never before. This time around, it’s much more demanding than simply engaging the original web. It involves crossing what I call the ‘Other Digital Divide‘, one that separates (most members of) the development community from ‘Digital Natives‘- younger people who have grown up taking the digital media and tools completely for granted. Hi Nalaka, I put together some initial thoughts for a “development 2.0 manifesto” at http://psdblog.worldbank.org/psdblog/2009/05/a-development-20-manifesto.html. Would appreciate your comments, if you have a chance. Whilst I agree with you that web 2.0 technologies can play a major role in opening up new audiences to the development sector, it seems to me that their real innovation potential is in new business models. What do you reckon? it is must to obey the right decision towards your social media web business because the SMM is now a blast place of bringing visitors or getting more revenue through , it can be bad if do something wrong way as above images showing the happening things which is not to apply . . just has to put the right thing which visitors like to see in your social account web page .